Please include either the cat's name or the url for this page so that we appropriately direct your kind donation. Stella was scooped from the street in a downtown Regina neighbourhood in the early days of spring, cold and hungry. She was obviously tame and loving, but no one claimed her despite multiple found posts. She was finally placed in a foster home, where she quickly took over and now rules the roost! Stella’s a social and outgoing kitten who was completely unfazed by the other cats in her foster home. She just moved on in and took over, demanding cuddles from her foster mom, snuggling up close at night and maybe just a wee bit of food aggression when the soft food comes out! Stella loves to love and be loved. She will curl up next to you in bed at night, and loves nothing better than to snuggle. She’s also active and playful, enjoying a variety of toys. While Stella can entertain herself, she is a bit mischievous and needs interactive play and stimulation to keep her busy and out of trouble! If you are interested in Stella, click here to view our adoption contract and click here to complete an adoption application or email the RCR Adoption Coordinator at adoptions@reginacatrescue.com for more info. 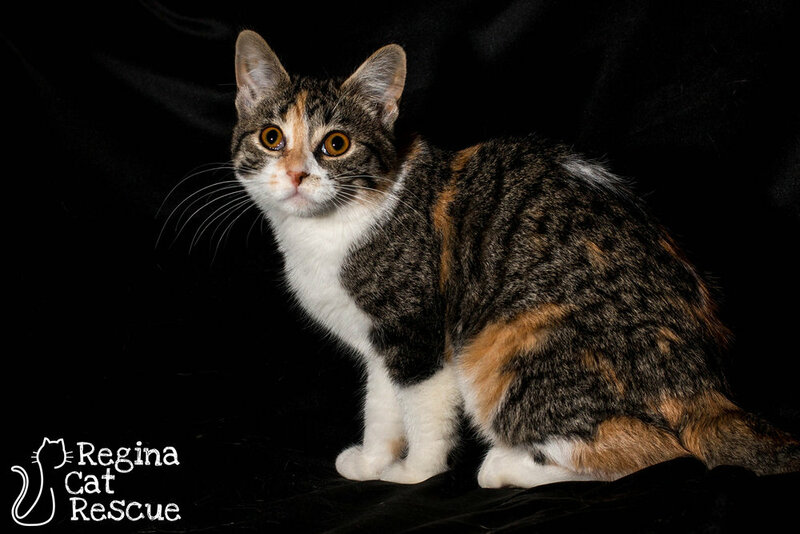 Please note: in the event there are multiple inquiries for a cat or kitten, Regina Cat Rescue will select the best suited home in the interest of a successful adoption. All adoption fees and sponsorship donations contribute towards veterinary care and other costs associated with caring for Regina Cat Rescue rescued cats and kittens. Frysta was half frozen and stuck in a tree during the bitter wind cold spell when a Regina Cat Rescue volunteer spotted her and got her to safety. Frysta suffered frostbite to her ears and tail, and she eventually lost almost half her tail due to the damage from the cold. However, she’s a spunky young cat and she bounced back quickly, enjoying life in her foster home. Frysta is energetic and loves to play. While shy at first, she’s very loving and once she bonds with you, she will stick to you like glue. She followed her foster mom everywhere and enjoyed pets and cuddles. Now that Frysta has joined the crew at Excalipurr Cat Cafe, she is making new friends, feline and human, as fast as she can. She can often be seen engaging in play with the many children that visit the cafe. Frysta would make a great family pet. She may take a few days to warm up, but then there is no end to the love and affection she gives. If you are interested in Frysta, click here to view our adoption contract and click here to complete an adoption application or email the RCR Adoption Coordinator at adoptions@reginacatrescue.com for more info. Charlie is a handsome and playful young cat who was stray during the chilly nights of early spring, and was lucky to be rescued by a kind Regina Cat Rescue volunteer who took him in and contacted RCR for help. 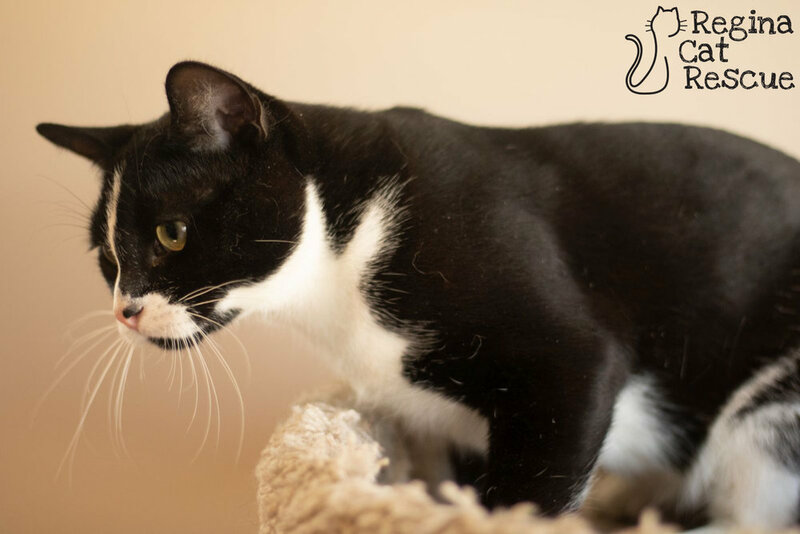 This good looking young guy is dressed to impress with his elegant tuxedo markings, and his laid back and loving demeanour. He adores playing with toys but is always quick to snuggle once he's tired out. Charlie is a sweet and lovable guy who just needs the right family to buy into his love story and say yes. If you are interested in Charlie, click here to view our adoption contract and click here to complete an adoption application or email the RCR Adoption Coordinator at adoptions@reginacatrescue.com for more info.